With our cabinets and appliances ordered, but not yet delivered and installed, we were in a holding pattern. I decided to call it the Great Cabinet Wait (which has since been trademarked to prevent the phrase’s unauthorized use). We couldn’t do any major updates, like installing backsplash or ordering a countertop, until the cabinets were in place. I wanted to keep moving forward with the kitchen, so I turned to smaller projects while we waited. 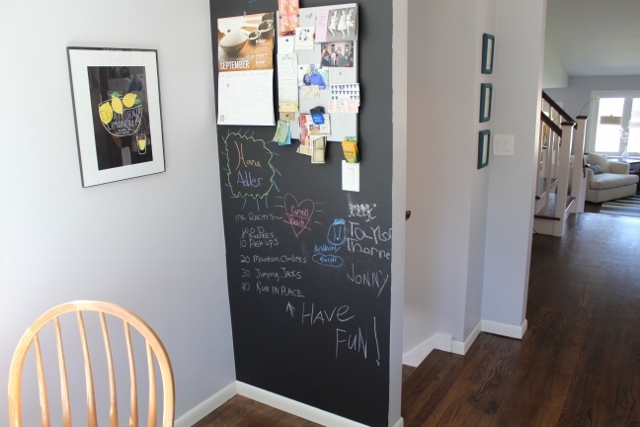 One of the first small items on my list was to paint a chalkboard wall in a small alcove in the kitchen and make the wall into a sort of “command wall” for us. Back in our old apartment, we had a huge command center in the kitchen that consisted of a chalkboard, bulletin board, and magnetic board. I kept our calendar there, pinned up invitations we received, and wrote down menus for the week. It was a great way to organize our schedules. Given the amount of windows in our kitchen, I noticed we really wouldn’t have room for the same or a similar command center in the space. Also, I had already hung the chalkboard in the guest room and the bulletin board in the office. I thought painting a chalkboard wall would give us extra space to write notes, hold a calendar, and have an added fun bonus of letting the kids in our extended families draw on our wall when they visited. 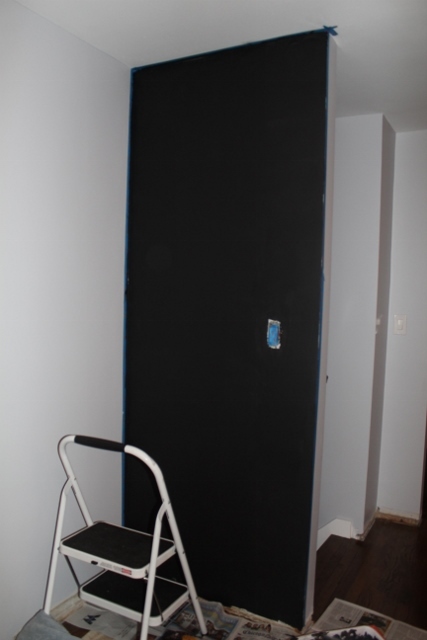 Painting a chalkboard wall was no different than painting a regular wall – all the steps are the same. First, I wiped down the wall and baseboards and applied painter’s tape for a hopefully crisp edge. Then, I got to painting. I ended up doing three coats, waiting about an hour between coats. I gave the paint about three days to cure before writing on the wall, but I’m sure I didn’t have to wait so long. It likely would have been fine to write on in a few hours. 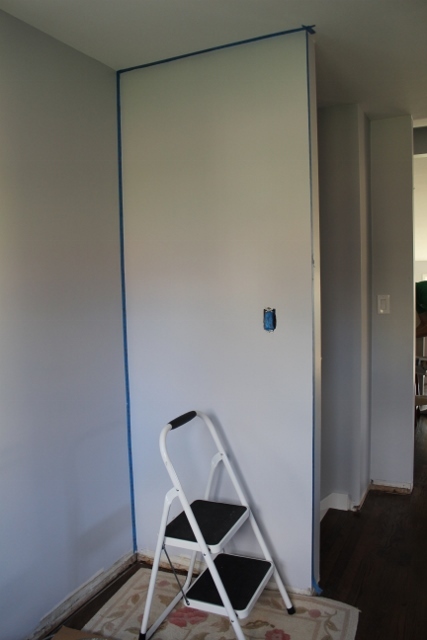 The chalkboard paint for this easy project was around $10. I still have about a half a can of paint left, so $5 for this small update was well worth it. I’m still trying to figure out what to do with the rest of the paint. Maybe dip some wine glasses? Make a chalkboard cheeseboard out of an old tray? Paint a piece of wood for a chalkboard sign? Create a chalkboard clock by painting the back part of the clock and writing in numbers with chalk? What would you do? « Where Should We Put our Dishes? Love this wall! Very cool!